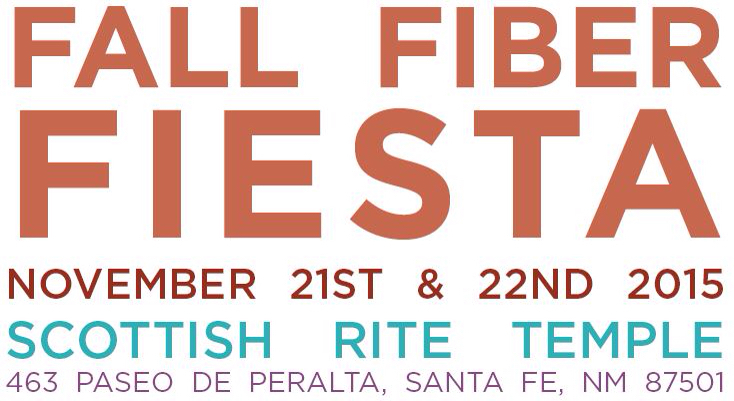 On November 21st & 22nd the Española Valley Fiber Arts Center (EVFAC) is sponsoring the annual Fall Fiber Fiesta. 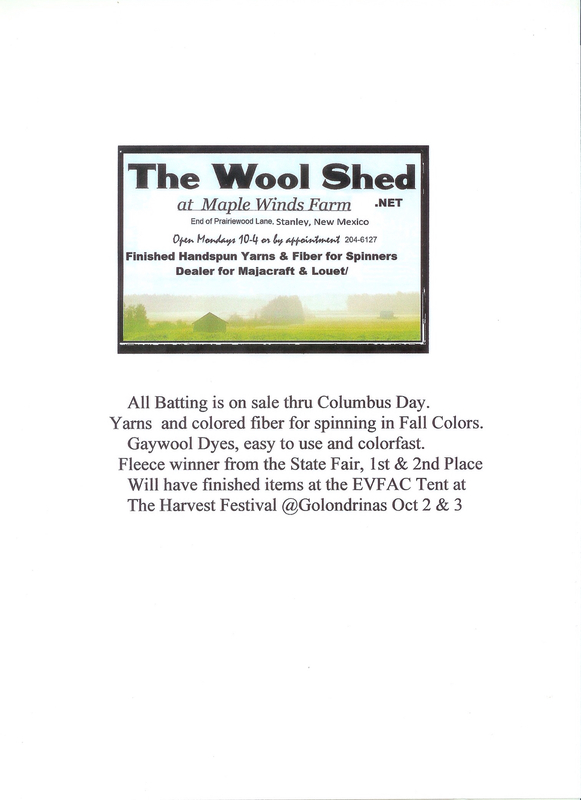 This event will include a fiber arts market, demos, & activities. This year they are excited to be holding this event at the Scottish Rite Temple in the heart of downtown Santa Fe. 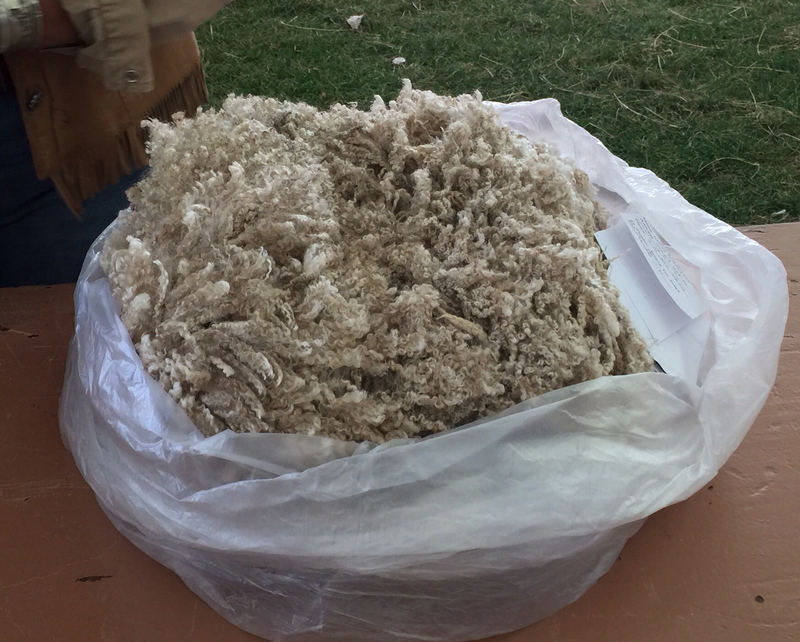 I attended the Taos Wool Festival this past weekend and had tons of fun. 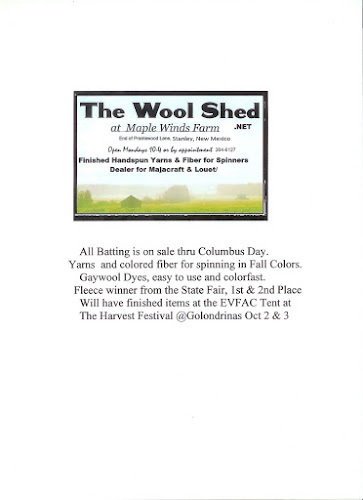 I bought some incredible fleeces that I hope to weave into fleece rugs. I took a class on making art batts and really enjoyed it. Taos food was fantastic and I was thrilled to discover how vegan/ vegetarian Taos is. Yeah! It is also a very dog friendly town, many stores will allow you to bring your dog inside. The restaurant patios were also dog friendly too. A very cool Saori Weaving loom, that we got to see. 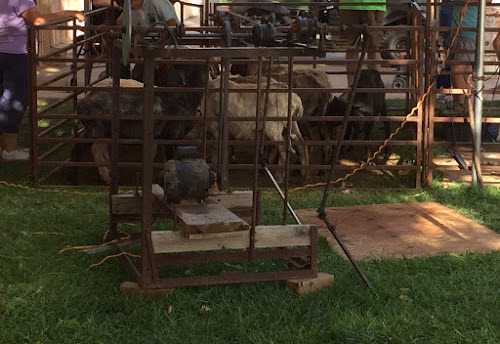 See this old fashioned sheep sheering machine. This and all kinds of cool stuff are at the NM State Fair. I have a new love in my life, it is four shaft weaving! It happened kind of unexpectedly, I love to work with wool locks. I often tail spin then I heard about weaving a rug out of unspun locks..it looks like a sheep skin but no sheep is harmed. 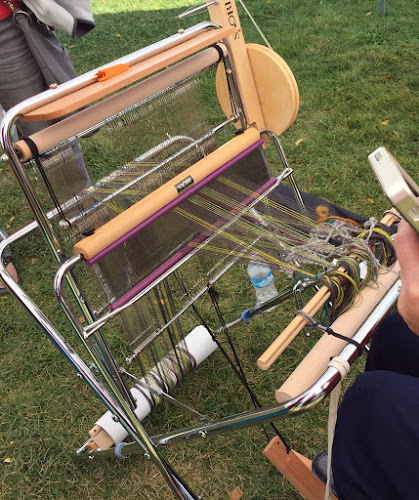 This type of weaving cannot be done on a rigid heddle loom. So I started my search for a floor loom that can weave rugs. An awesome rug weaver from Abiquiu, NM told me about a used four shaft floor loom for sale in Espinola..And I got a lovely floor loom. 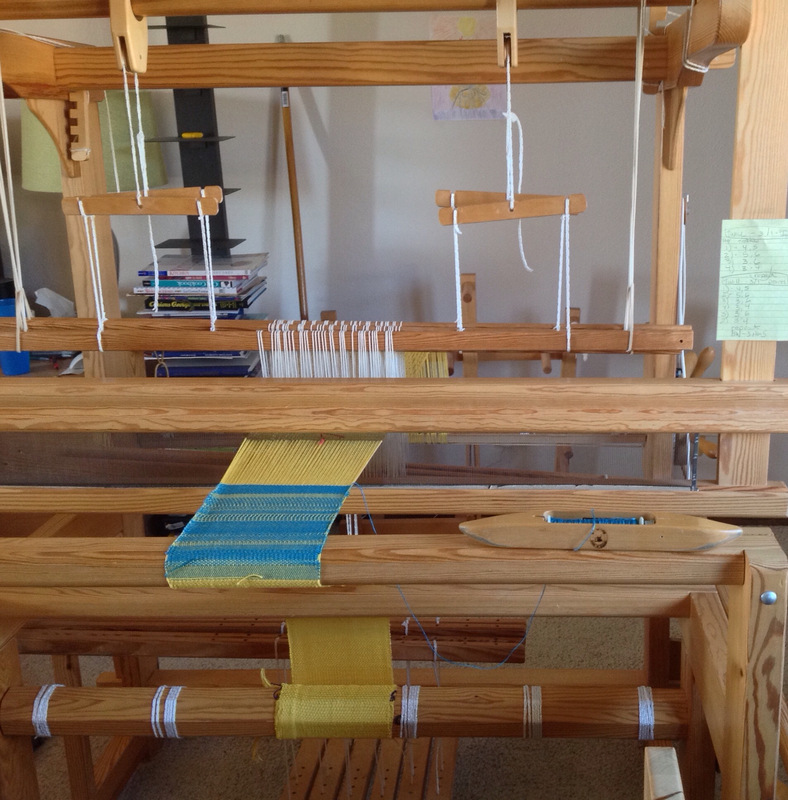 I took the loom home and put it together and warped it to weave a sampler. It seemed to me I should know a little about the other types of weaving. Well I discovered the power of weaving with four shafts. It is soooo cool. With the same threading sequence you can weave a variety of designs. I am totally smitten. Today I wove several inches of crackle weave and it is still love. The design is just amazing! Designing crackle patterns is way out of my league now, but folks this is so cool! You have to try it. Aren't the colors incredible ! Who knew you could get such beautiful colors from natural dyes. Some of the natural dyes we used were madder, logwood, indigo, cutch, cochineal, fustic, weld, Quebracho Rojo. 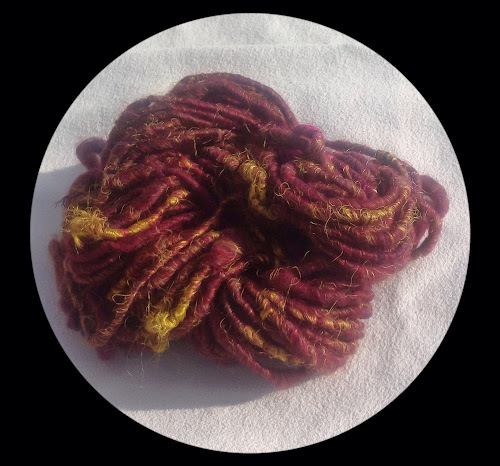 We even recreated the Pantone color of the year, Marsala, using natural dyes. My latest fiber endeavor is thrum batts. I am using leftover thrums from weaving and carding them into art batts. Here are some photos of the resulting yarn. All of the batts were carded twice. The yarn is all core spun. 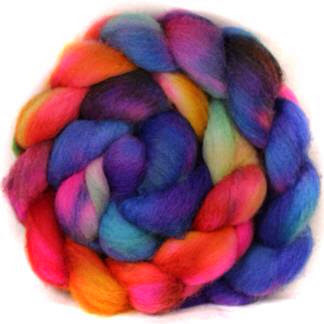 This first yarn was created by using a batt that included silk thrums. I bought the thrums from etsy. 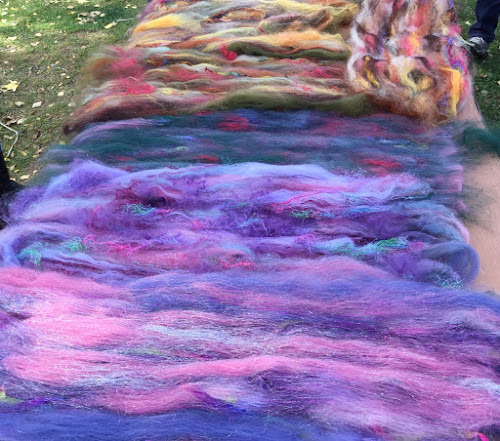 This yarn was created from a batt using silk thrums and my homemade thrum, a hand spun single that I cut at about 4 inches. I think I prefer the finer thrums for this use.. This single is just a little heavy... Maybe if I cut the pieces shorter but then it would have a lot more fringe on the yarn. It does add interesting texture. A few weekends ago I took a workshop taught by Jacey Boggs Faulkner. It was a great workshop. Jacey is a good teacher and a great spinner. She is also the creator of PLY magazine, this is a great spinning magazine that is well written with beautiful photography.... Really Really Beautiful(even if you don't spin you will just enjoy the photos)! One of the topics covered in the workshop was woolen spinning. One of the elements of woolen spinning is the long draw method of drafting. I have often found this method of drafting very hard to do. I am going to try to learn this method of drafting and the plying and finishing to go along with it. The work shop taught this and I stumbled along(I am not the fastest learner ..especially when it comes to my hands translating that). Below is a picture of my early attempts. I think there are not many singles that looks as pretty on a bobbin as Thick and Thin yarn. 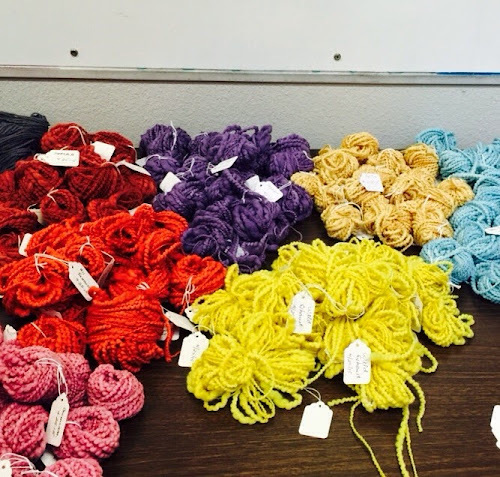 This yarn is also known as slub yarn. 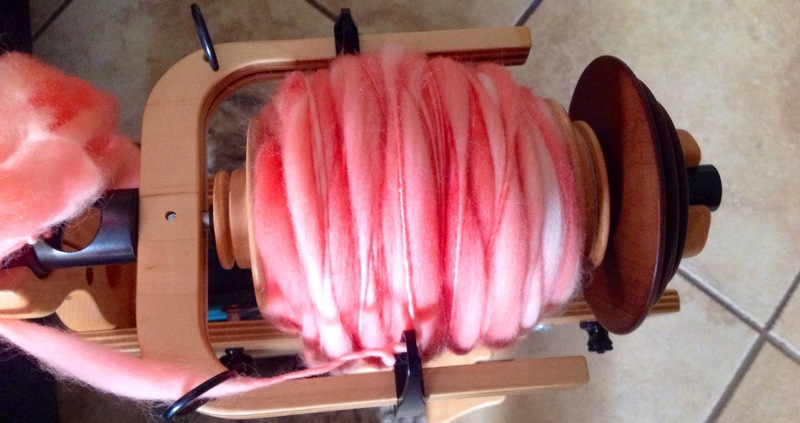 I love that it looks like fluffy clouds on my bobbin. 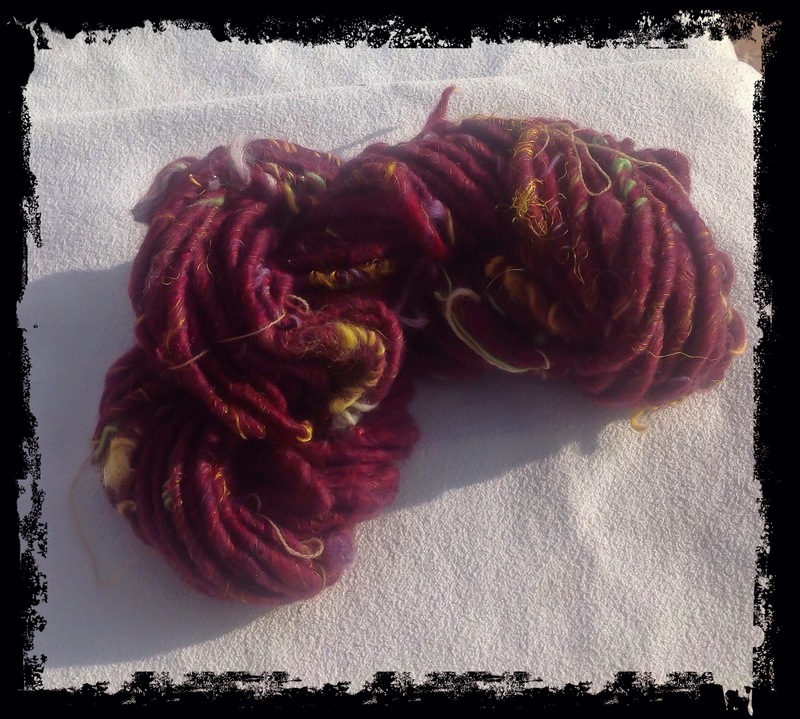 It can be used as a single or it can plied. I plan on plying my bobbin. I will spiral ply and make some coils thorough out. The coils look like little beehives but are easier to make. I will either make the yarn into a hat or a cowl.. I cannot decide on that yet. Well I finished knitting and blocking this and I love it. 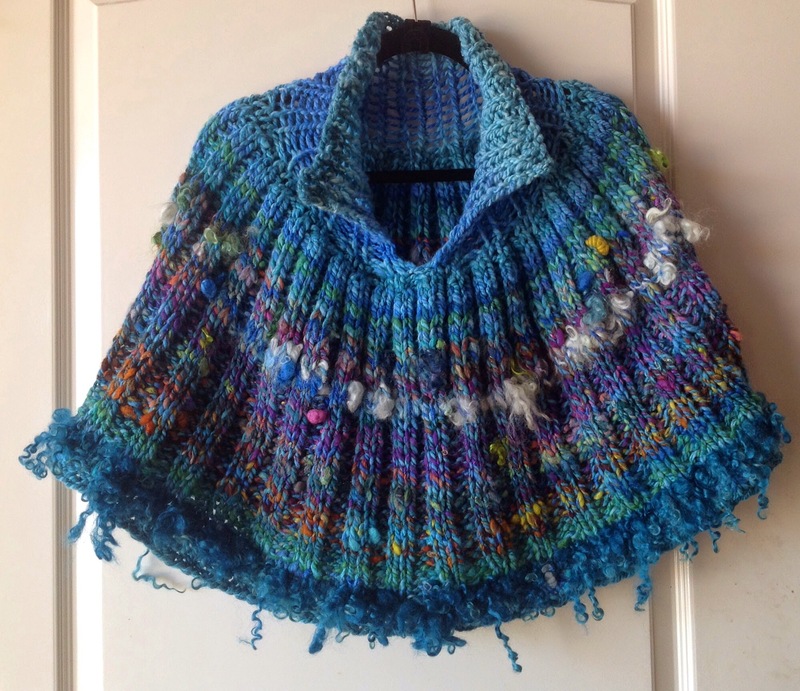 I wrote about it earlier, the pattern is Venetian Blind from Ravelry. The fiber was my kitchen sink single..( a little of everything spun on the fly) plied with a single spun turquoise merino braid from Quillin Fiber Arts. 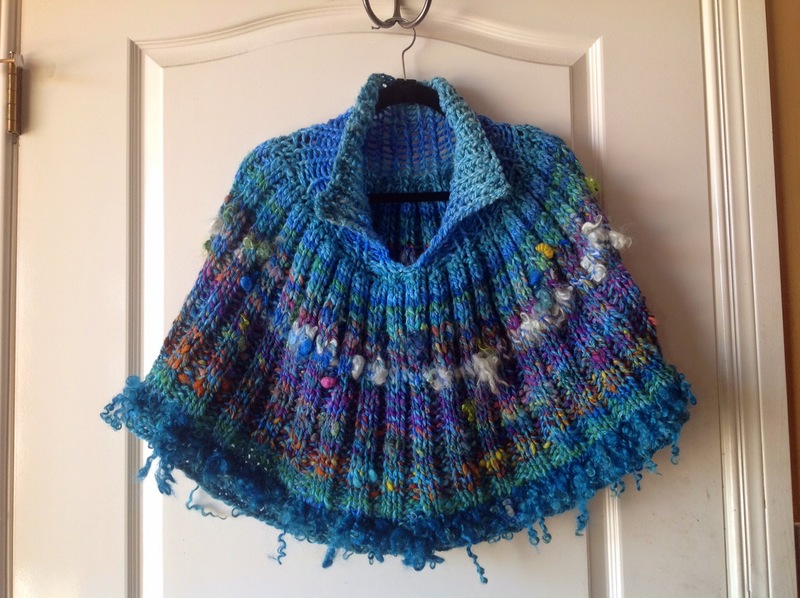 I used the same color to create a bulky two ply to knit the collar, the increases and for binding off. 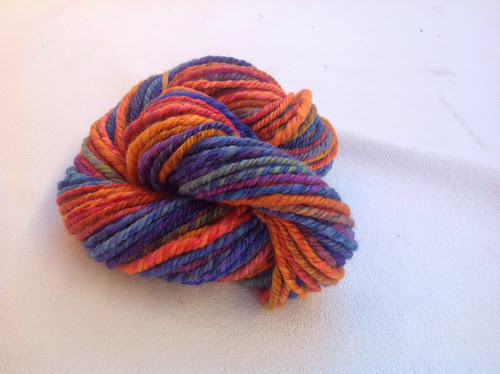 I spun a tailspun yarn with locks from https://www.etsy.com/shop/MarkreeWoolCraft on etsy. When I watch TV I try to do something else at the same time. If I knit while I watch TV I end up messing up my stitches, I don't seem to have as much of a problem with spinning. Spinning is such a tactile craft..I think you could almost do it with your eyes closed. With the lovely braid I just spun you definitely want to look. The color way is called Kaleidoscope, it was dyed by Gritty Knits. I am going to practice my chain plying, sometimes called Navajo Plying. I hope that it will keep the colors together and give me more practice chain plying. When I spun this I tried hard to spin across the braid so that I would have longer sections of color. It seemed especially important with this braid since the color sections in some parts were kind of short. 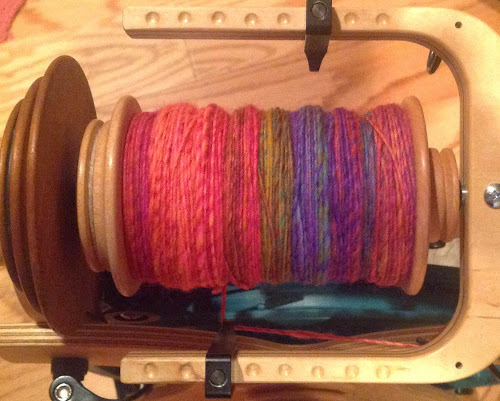 Below is a picture of the braid on the Bobbin. Here is the stock photo of the merino braid since I forgot to take a picture of my braid.